This is one of the most auspicious yogas in Vedic Astrology. This is where a person's religion or spirituality becomes his duty or work. So, lets see What is Dharma-Karmadhipati Yoga? In a horoscope, 9th house is house of religion and spirituality. Likewise, 10th house is house of duty, work or actions. So, whenever Lord of 10th house and Lord of 9th house connect with each other, it creates a Dharma-Karmadhipati Yoga. For example, in this horoscope, 9th house has Leo Sign therein, Leo's Lord is Sun. 10th house has Virgo sign therein, Virgo's Lord is Mercury. Now, Sun and Mercury both are sitting together in 10th house. Here, it creates Dharma-Karmadhipati Yoga, which means this person will take spiritual duties in life. One of the example I can think of right now is Deepak Chopra. This yoga makes a person very well-verse and knowledgeable about spiritual texts. These are the people who can give a whole new meaning to an age old religious text which none ever thought off. As 9th house is also a house of long distance travels, this yoga makes these people to travel to other countries or far distant places to preach and teach about religion. Now, lets see different ways in which this yoga can form. 1. The most powerful is the one in picture, where 9th house lord and 10th house lord are in conjunction in 10th house itself. This is THE strongest Dharma-Karmadhipati Yoga. Here, along with Dharma-Karmadhipati Yoga, it also creates a Raj-Yoga as Lord of a Kendra house is in conjunction with Lord of a Trikona House. 2. Second way is when 9th house lord and 10th house lord exchange each other houses. It means, if in this picture, Sun (Lord of 9th house) sits in 10th house and Mercury (Lord of 10th house) sits in 9th house. Here, along with Dharma-Karmadhipati Yoga, it also creates a Parivartana-Yoga. 3. Third way is 9th house lord and 10th house lord aspect each other or their is one planet aspecting the other. Now, this yoga is most powerful in Kendra Houses (Houses # 1, 4, 7 and 10), Trikona Houses (Houses # 1, 5 and 9) and Upachaya Houses (Houses # 3, 6, 10 and 11). Why Upachaya Houses are good for this yoga? I feel it is because of the reason that Upachaya Houses grow/improve with time and our knowledge of any text (either spiritual or academic) also improves with time. As always, this yoga will also come in to force when person goes through Mahadasha/Antardasha of planets involved. @ prasad - it is active. @ TG - yes it is. @ sastry - life path related with occult, mysticism and spirituality. 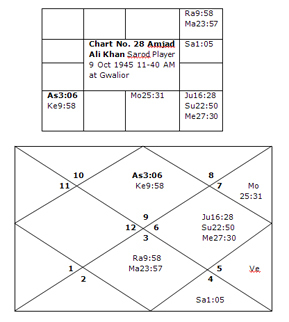 I have dhanur lagna and sun mercury jupiter conjunction in 12 house.what does it indicate. sir,i have makar lagna and rasi,surya also in makar.9th and 10th lords shukra and budha in 12th house dhanu rasi.will shani transit in 12th house activate this dharma karma adhipati raj yoga? @ RB - u can expect gain in career thru higher education or skills. u may travel a lot. Sir, Kanya lagna, Vrischik rashi. Lord of 9th house is Shukra and lord of 10th house is Budha. In my horoscope both are sitting in 3rd house at 23 degree. From 19th February 2018, Budh antardasha under Shukra Mahadasha shall start. What can I expect here?